This post is essentially meant for those of us who suffer from food intolerance and plan to travel. I would like to share our experience of traveling from our home in France to Tokyo early this month, knowing that my husband is allergic to sulfites and intolerant to most dairy products and that, for my part, gluten does not like me at all! As we live in an area with few trains to Paris, almost every time we take a plane we have to spend the night before in a hotel if we want to be at the airport early enough before boarding. This makes things a little tricky: I need to plan for several meals before the one we are served on the plane! Here is what we carried in our backpack; I had made and frozen the baked goods one month before. I was glad to see that my dried tomato mozzarella basil loaf was excellent, even defrosted and eaten cold! And if you are interested in the vegetarian version of the kohlrabi pies, it’s here. I should have planned more snacks for my dear husband: by the time we reached Frankfurt where we had a stopover, his stomach was begging for food already and he bought himself a sandwich with no cheese, but containing ham, most likely with dextrose (made using sulfites)… As a result of this, unless it was the stress induced by the trip (we experienced a very rocky take-off from Frankfurt due to a strong windstorm), he had a little asthma on the evening of our arrival. Once your plane ticket has been purchased, most airline companies offer you a choice of menus. If it is relatively easy to get a “gluten-free” menu nowadays, no “sulfite-free” meal is offered… What to do? Because of the too many additives that hide in industrial gluten-free food, this was not an option for my husband. In the end, in order to avoid dairy, he went for a “vegan” menu. However, it came with a fruit cup… with some grapes in it. So we exchanged our fruit! The airline also provided us with breakfast. Like a mother hen, I couldn’t help but glance at my his tray. I could tell there were some words in bold letters inscribed on the aluminum foil covering it. I took a closer look and cried “stop!”: even in German and hardly legible (black on dark gray), I recognized the mean “… disulfite” word! And so this is how my dear husband landed in Tokyo, feeling empty-stomached and a little grouchy. The return trip was a complete different story. We had a direct flight on ANA – an airline company I highly recommend: comfortable seats even in Sardine class, and above all, fresh produce. My husband had chosen a “raw food” meal this time and he was not disappointed. No meat for him once again, but he could have easily stolen some from my own tray. It is one of the advantages of traveling together. You can share the food! However, there was no such list on the burger’s wrapping paper itself. For more information, we would have needed to flash the QR code with a phone much smarter than the seven year-old one I carry around. Or maybe ask the employee to do the research? In any event, it would not have solved the Hungry Traveler’s problem. We still had to worry about eating before getting on the train. Luckily, I spotted an organic food store just across the street from our hotel! I rushed there in the morning and bought fresh fruit and preservative-free salads, one of which gluten-free for me. Relief! And now, dear neighbors, I am happy to share some photos from our trip. There will be more in my next posts, I promise! These amazing buildings can withstand earthquakes! Are we really in Tokyo??? Yes, we are! Both photos were taken on the artificial island of Odaiba. A very quiet place in January. And the cleanliness! Awesome. Arriving back in Paris was somewhat of a culture shock after a whole week of no litter in the streets – and yet no trash cans! We only got to see Mount Fuji on the day we departed, from the airport…. It was as if it was taunting us, telling us to come back! Goodbye, Japan… This is Siberia seen from above! Really great advice, beautiful photos too. 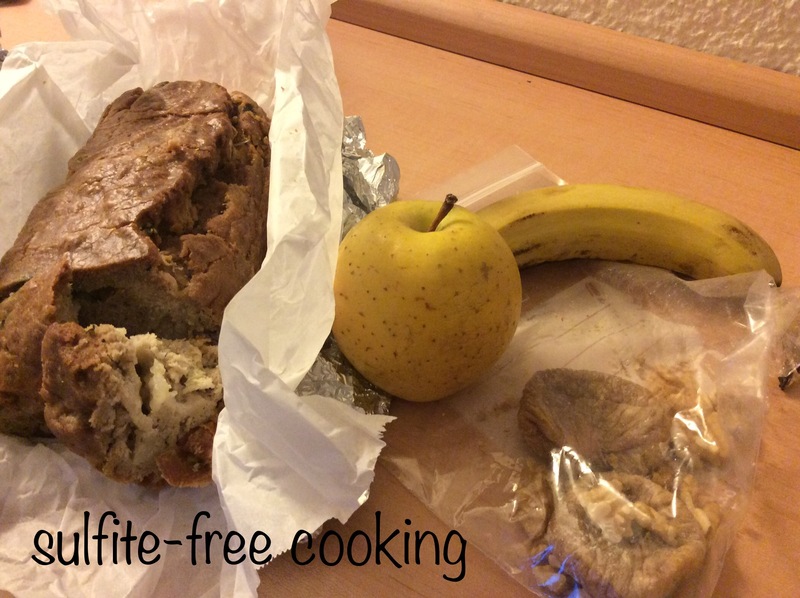 Travelling with unknown food allergies/intolerances is something that should be covered more. I know this will be a great help to anyone travelling abroad. For me, even if it’s a day jaunt I still have to cook and plan ahead. Those tartlets look delicious, are they still as good cold as warm? I’ve never thought of freezing filled pastry for a cold snack. See? You’re teaching yet again, dear neighbour. Yes, you can freeze filled savory pies without any problem, I do it all the time. Depending on the filling they can be eaten cold, but I find it preferable to still warm them up a bit after defrosting: it brings the crust “back to life” if you see what I mean. Then they can cool down again. In France, a lot of people have cold quiche when they go on a picnic. Someone else had started a vlog in French to tell about his trip to the island of Réunion with his family. He can’t have gluten, dairy or eggs. He posted two or three episodes, and then stopped quite abruptly. I hope nothing bad happened. My Hungry Traveler had no problem eating in Tokyo, I was so happy about that. I will write a post on food next week probably. It’s something I should practice, but you know how it is then the freezer is already stocked and you just can’t find the right time to eat anything new when sticking to a dietary plan. I’m glad your husband was able to eat on his travels, he’s lucky to have had such a diligent travel companion! Lucky? With me around, he can’t “splurge” without feeling guilty!!! A small clarification on warming up the pies after defrosting: I think the reason it makes them “like fresh” is that it removes some of the moisture that freezing inevitably adds. Will be in touch via mail to show you my trials (and tribulations) of gluten-free pasta going through the machine. This will include trying your recipe.